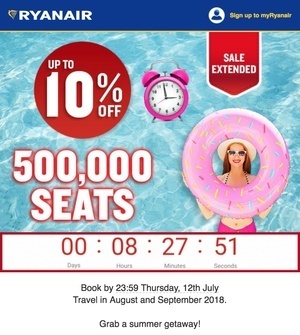 Marketing email from Ryanair drops into customers’ inboxes announcing an eight-hour extension of their summer sale. Posted in Misc and tagged Ryanair strike at 3:54 pm on July 12, 2018 by Bodger. So should they stop sales of tickets until the pilots come back on duty? Does anyone even consider 10% off, a “sale” worth bothering about? I never have, just wondering…. That’s a sale I’d look at ! +1 on all that, thanks for the online tip too! actually even today I swung a markdown on a new laptop…well known manufacturer with a chat support applet on the website…they had an offer campaign on certain models but not on the one I was after…so I opened up a sales chat, explained what I was after (not failing to mention similar laptop from rival, hinted was a pity no offer on for particular model) and bingo the rep opened up a discount code field on my cart checkout, gave me a code, -15%, nice deal! And thanks for the tiles tip! We’ll try that later this year! I just find it odd, and somewhat upsetting, they used a clockface image used isn’t set at the ubiquitous ’10 to 2′. But it’s got three hands – when there is a second hand it is usually shown as above – with the hour, minute, and second hand equidistant. The exact time is irreverent. Time IS irreverent in a way, if you think about it. Well, 6:30 is the best time on a clock!